RVnGO is America's best marketplace to find RVs to rent in New York. Find your RVnGO! 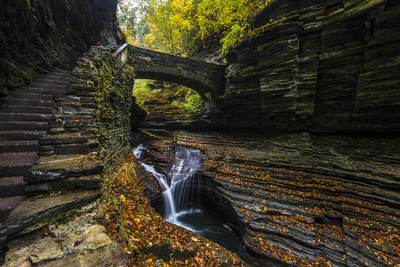 A four-season playground of waterfalls, gorges, rolling hills, woodlands, 11 glacial lakes and one Great Lake, the Finger Lakes Region of New York offers 9,000 square miles of fun for the whole family. With plenty of festivals, events, food, wine, and outdoor activities to explore you're in for a treat! In the temperate months you can, hop in a hot air balloon for a ride, zip line, take a ropes course, like "The Grand Canyon of the East" at Letchworth State Park, stroll along the Erie Canal, bike past lakes and vineyards, and get on the water to fish, swim or just float. Winter months offer skiing, boarding, snowmobiling or snow shoeing, there is something for everyone to enjoy. At one billion years old, the largest marble cave entrance in the east is a massive stone bridge that will rock your world. A New York Adirondack natural wonder, The Caves Park has underground grottoes, gorges, raging waterfalls, tranquil pools, and marble connects. The recreation center offers a self-directed tour, and/or you can take a guided adventure where you get to float in the caves during the months of July and August. There are various campgrounds for a RV rental in New York State where you can camp, so you can fully investigate the Natural Stone Bridge and Caves in Pottersville for as long as you please. Straddling the border between New York and Canada, the Niagara River produces stunning waterfalls that will leave you in awe. The Niagara Falls State Park is the oldest state park in the U.S. Established in 1885, the park has an Observation Tower at Prospect Point which juts out over the gorge for a view of three waterfalls, the American Falls, the Horseshoe Falls (sometimes called the Canadian Falls), and the Bridal Veil Falls. Every second, 3,160 tons of water flows over Niagara Falls. Falling at 32 feet per second, it can produce 4 million kilowatts of electricity. A spectacular sight to behold, there is also an aquarium at the Niagara Gorge Discovery Center where you can see penguins, seals, and sea lions. A ten-minute drive from downtown Schenectady, Arrowhead Marina and RV Park is a great place to park your RV rental in New York to explore historic points and places of interest. With a lovely view of the Mohawk River, it can suit a wide range of RV trailer rentals. Services include wi-fi, satellite TV, water activities at Mohawk River, pontoon marina, dock and slope, exercise classes, RV stockpiling, restrooms and showers, and laundry area for your New York State RV rental. Stop season is from May 15 to October 15 for your RV rental New York. One of the highest rated RV stops in the state, Black Bear Campground is in scenic Orange County, an hour from New York City. Loaded with amenities, it has 160 accessible all-climate full hookup spots with tables, fire rings, and space for slideouts. Resources and pleasantries include a swimming pool, angling, nature trails, open-air amusements, game room, structure, frisbee golf, mini golf, play area, shuffleboard, horseshoes, planned exercises, recreational corridor, wi-fi, RV supplies, fishing supplies, laundry area, and restrooms and showers for your New York travel trailer rental. The Park's proximity to the city makes this a perfect to spot to stop your RV to explore NYC at your leisure. Perfect for a class A RV rental in New York, Jellystone Park at Birchwood Acres is a family-accommodating resort RV Park with plenty of activities for children of all ages! It has 215 all-climate accessible spaces, 112 of which are full hookup destinations with tables, fire rings, and space for slideouts. Services and luxuries include a 5-acre lake for angling, heated pool, whirlpool, bobbing pad, water slide, pontoon rental, horseshoes, exercise classes, amusement room, recreational hall, tennis, Frisbee golf, goods, cafes, wi-fi, digital TV, golf carts, perishables, angling supplies, restrooms and showers, laundry area, and more! Appreciate quality time with the family at Jellystone Park at Birchwood Acres in your New York trailer rental. The season is April through October. Calling all garlic lovers, look no further than the Hudson Valley Garlic Festival held in the town of Saugerties at the end of September to get your fix. The two-day celebration started in 1990 and commands everything and anything about garlic! Its main attractions include a Garlic Food Alley, Garlic Marketplace, culinary expert exhibits, showings and lectures about garlic, a childrenâ€™s area, food merchants, craft area, musicians, performers, gallery and loads of garlic! Have a blast at the Hudson Valley Garlic Festival in your class B RV rental New York! One of New York's biggest yearly waterfront celebrations, the Oyster Festival is held in Oyster Bay each October. The celebration started in 1983 and is a noteworthy fundraising event for the Oyster Bay Rotary Club. Raw on the half shell, fried or in a stew, it features 60,000 oysters, along with lobster, clams, soft shell crab, scallops and more, meat and dessert lovers will not be disappointed, either. It likewise includes artisans, live music, fascinating creature petting zoo, ships, pirate shows, oyster eating and shucking challenges, halfway rides, and a mess more! Bring the whole family and have a ton of fun at the Oyster Festival. Whether you need a one-way RV rental or plan on cruising around the state, the province of New York is vacation hotspot you should visit for as long as time permits. This is the ideal time to lease a RV to New York at RVnGO to secure your vacation getaway.